A little dress for all occassions! We have that one dress we keep in the wardrobe that we can pull out for an occasions, and I’m not talking about a dress for a wedding etc. I’m talking about that one dress you can pull out if you have a family reunion dinner, a christening, a communion, or any type of occasion like that…more like a day time dressy occasion, (that is not a wedding) as we all have those type of events.. 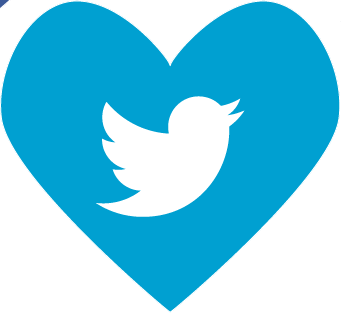 So I wanted to show you my one….and this is it! The one I’ll be pulling out of the wardrobe for any such occasion…. The beauty about this dress is it looks like a skirt and top but its all in one…I can literally throw it on and head out the door. I love the easiness of it. 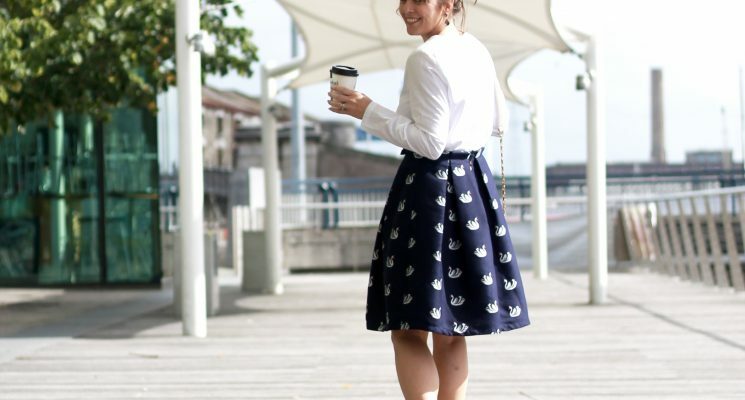 Its a full navy coloured, swan design skirt and you can pair it with any type of heels…The back is button down which makes it that tiny bit different. Its a shirt type material on top which makes it very breathable and so comfy. Heels were Littlewoods as before and Earrings Parfois. 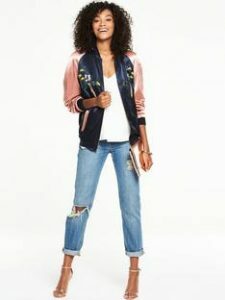 Previously I posted a fab bomber jacket from Vanilla Boutique, and I think I’m currently having a love affair with bombers lately. 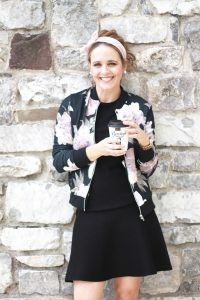 They are so easy to just thrown on over anything…this time round I threw them on with a cute skirt, and anything that’s not to hard to dress up or down is always a winner in my books! This bomber I picked up in new look in the sale for €18, couldnt just leave it there at that price. 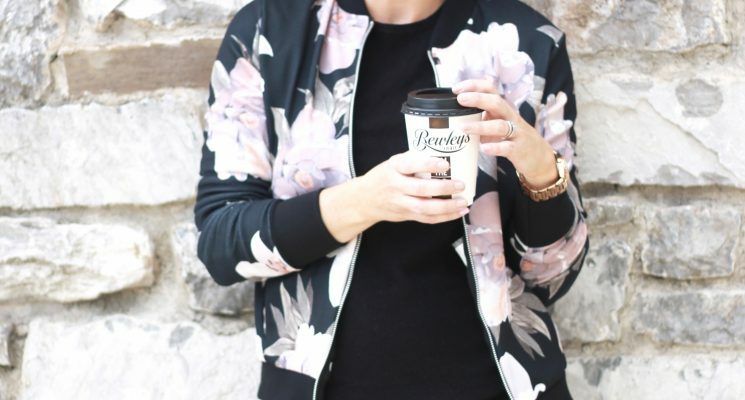 its a lovely comfy bomber, and the material is soft and breathable not stiff! Some sizes available here. 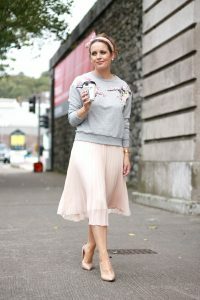 The skirt is so comfy and its a fine knit kick out hem skirt from Penneys, there are still some available at the moment. Fringe boots are oldies from Dunne Stores. 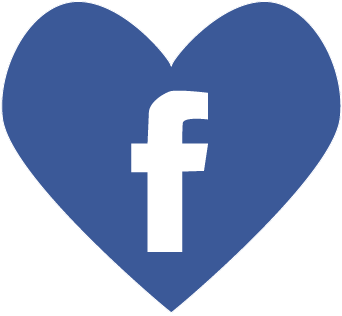 But you can find similar here. The black jumper underneath is Zara which I picked up last year but its a basic piece so they restock it every season and you’ll find it online here. My hair was styled by the fabulous Aisling all her details are here and I popped a hairband in from New Look that cost me €4.99, my latest obsession by the way!! All pics were by the Emer Irish Fashaholic whose talents are never ending.. 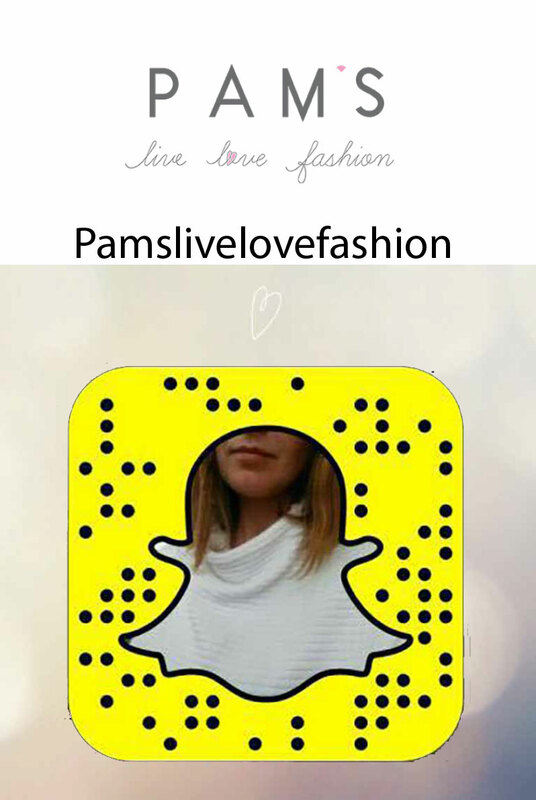 It was so quick but great fun….as you know from my snaps (@pamsfashion) Friday kicked off with Cork Fashion week. It was a fantastic night in the Castlemartyr Hotel, with some amazing new Irish Designers showcasing their creations but I’ll have more on that later.. I know a few of you were asking about my outfit for Day 2 of Cork fashion week, which was the Fashion Hub at Cork Opera House. So here’s the details! 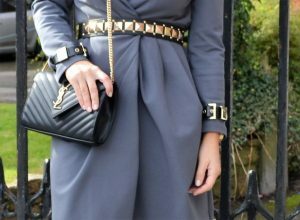 I wore a coat from Vanilla Boutique, for more details contact the girls here its a stunning piece and can also be worn as a dress. I popped a studded gold belt that I got a few years ago in mango around the waistband. The cuffs on this piece are so unique and matched the gold of the belt. The cuffs are almost like separate bracelets, I love them! The bag was a gift from my husband. 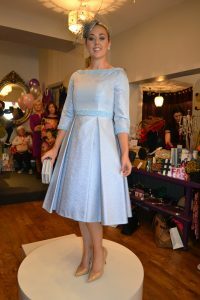 I will have a couple of more blog posts on Cork Fashion week with all the details on what we got up too. 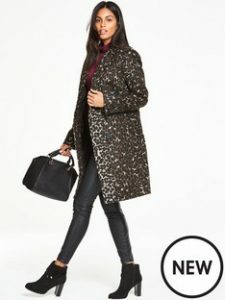 I’ve always had an eye on Littlewoods, and in recent times they really have managed to get more & more Brands on board along with fabulous collaborations in recent years. 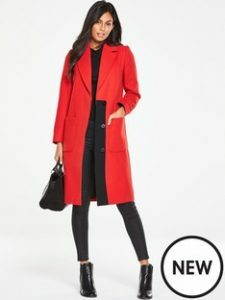 I’ve lots of lovely finds hanging in the wardrobe from Littlewoods and when the new label V by Very came online, it has certainly caught my eye! You know girls I’m all about affordable clothing and V by Very hits it on the nail, affordable and fabulous! This debut collection is built around the multi-faceted lives of women. 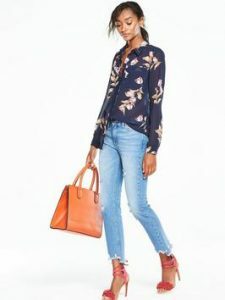 It caters for casual and boho girls, party dresses, tailored looks for the working gal with everything else thrown in. I’m loving the collection! 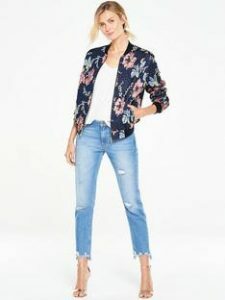 They have something for everyone and every shape, It has gorgeous pieces this bomber is so cute and so wearable with jeans as above or theme it with a skirt, perfect for day or night wear! 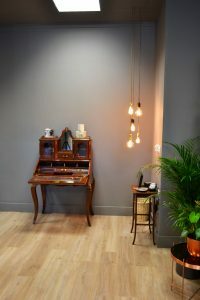 For the working girl, there is plenty of choice, here’s just a taster! For any girl with a wedding, christmas party coming up these two beauties are to die for..again they are only a taster of what else is available with the new label! 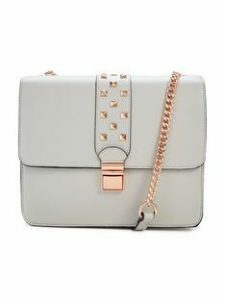 They have amazing accessories too ..my favourite is this bag below …less than €35! 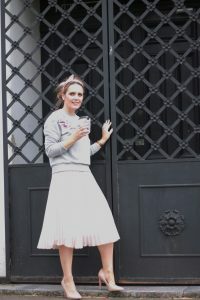 Pleated skirts…keeping it semi casual! 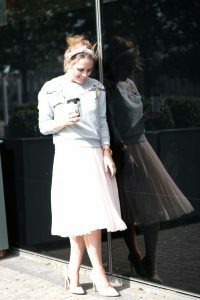 Pleated skirts are everywhere….similar to the tulle skirt…although not as fuller a skirt. 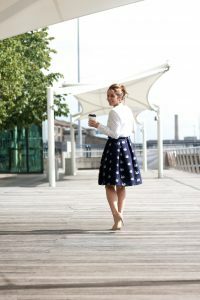 I love the pleated skirt, I was afraid of it at first as I always thought it would make my hips look larger than they were, but the way they have designed them with more of a floatier feel in the material, tends to sit better on my shape. 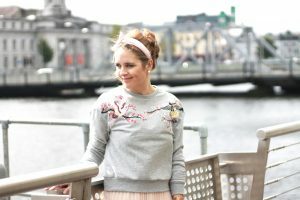 In fact the whole outfit is penneys apart from the headband which is new look and heels as before from Littlewoods for €15 here, the jumper is current stock and can be worn larger or neater which I went for, as my skirt was quiet floaty. As a young one I was never the best at taking care of my skin …in fact I was brutal!! Late nights out not drinking enough water..falling into bed with makeup still on, you get my drift!! 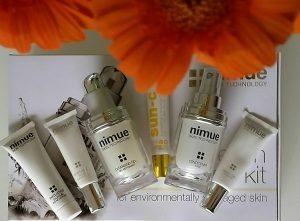 So let me give you a little bit of background ground on Nimue, it was originally developed in 1994 aimed at the medical market for pre and post operative applications but then Nimue introduced a new skin classification. 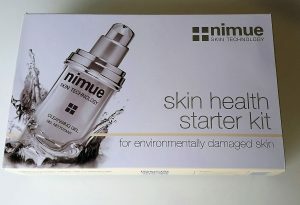 So basically it is a cosme pharmaceutical brand that is globally recognised for its modern skin classification concept (Environmentally Damaged skin, Hyperpigmented Skin, Problematic Skin, Interactive Range) and unique philosophy based on four treatments principles, rejuvenation, Restoration, Antioxidation and Sun Protection. In other words it penetrates the top layers of your skin and encourages the skin to work and repair itself with the help of the products. 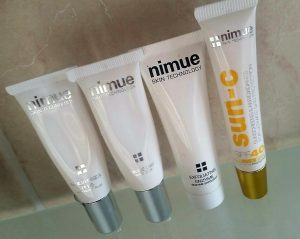 I have been using Nimue for over two months now if not more. I always feel you need to use a product for a long lenght before seeing the results. 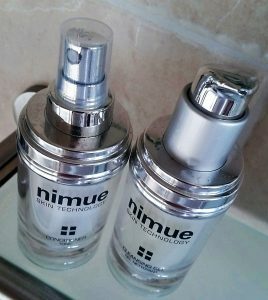 With Nimue I will be honest I find it fantastic…it has reduced down the brown marks on my skin caused obviously from sun damage. 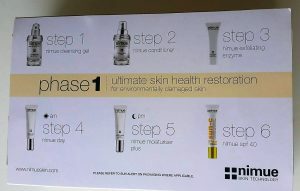 I am just finishing the starter Kit that I was kindly given to try and I have since purchased the moisturiser, I’m not getting paid to promote the brand, I just find it is amazing on my skin and I have seen obvious results from using their products. 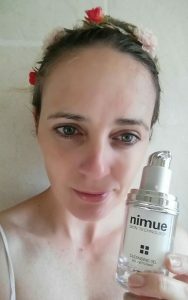 I am completely converted to Nimue, this product is not readily available to buy in pharmacy’s/stores or online, there is a specific list of trained and qualified salons nationwide, which is more professional in my opinion as you get the correct advice on what will work for your skin and what product is more suitable to you. 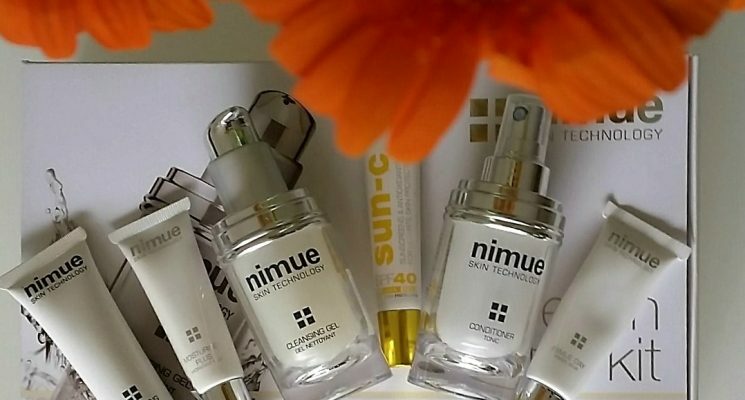 For a list of stockists you can contact Niamh Sales Executive and Educator for Nimue Skin technology Ireland on 087 4665842. 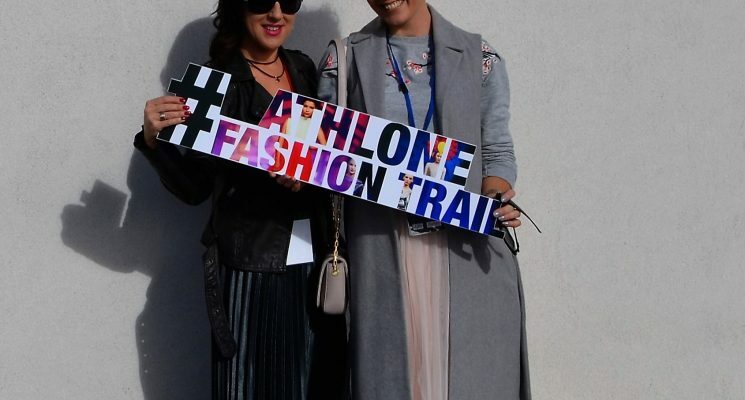 In case you all missed the 100’s of snaps (pamsfashion) last saturday, here’s the low down on what we got up to at Athlone Fashion Trail. 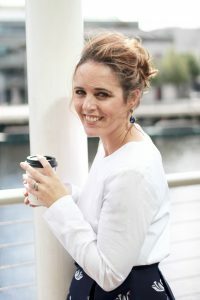 First off can I just say I was so delighted to be invited to attend this event by ITWBN as it was my hometown..I am all about supporting local in Ireland but particularly in Westmeath (My native homeplace) and my second home Cork! 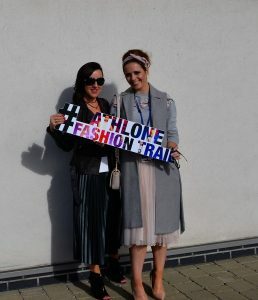 SO what was Athlone fashion trail all about? 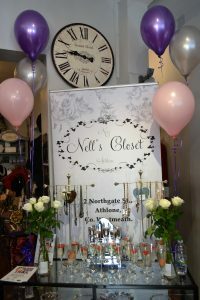 ?..well it involved us walking around Athlone town to visit some of the hottest shopping spots the town has to offer!! I was giddy with excitement on Saturday 01st when I landed to our first stop Colm Quinn BMW for a quick breakfast, but it wasn’t the breakfast I was interested in, it was all the gorgeous BMW’s/Minis on display..Priorities!! 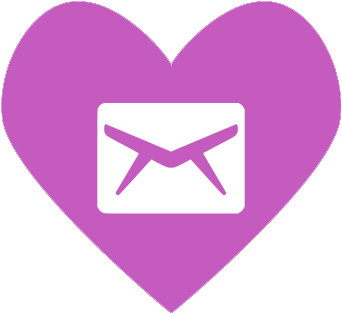 Hubster if you’re reading this …christmas is coming no pressure!! 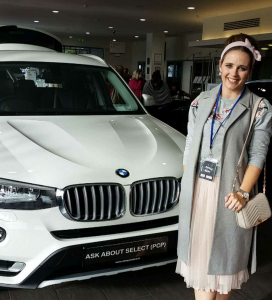 It was just lovely to catch up with my fellow bloggers from the ITWBN blogger network too and watch all the hair and makeup happening backstage in Colm Quinns showrooms with the fabulous Catwalk Models…As the first show starting at 11pm we were chauffeured in style in BMW’s to Kadee Bridal. The temptation not to hijack our BMW was unreal! 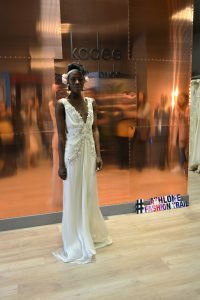 Kadee Bridal was amazing there are no words for the beautiful Bridal dresses we saw..I seriously want to renew my vows..they also had a beautiful spread and prossecco waiting for us, and what a beautiful showroom…so elegant and tastefully decorated. With a quick walk over the river Shannon with beautiful views of the Cathedral and Athlone Castle, we arrived at Burgess of Athlone, it was founded in 1839 and is famous for being the longest established department store in Ireland.It caters for all ages, both men, women and children, not to mentioned a gorgeous selection of homeware. Some fabulous brands and gorgeous stock for Autumn/Winter ’16. 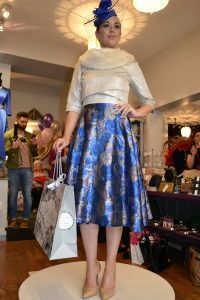 A quick hop and we were outside Olivia Danielle, love this boutique for the glamour, they stock amazing pieces and I know this as fact, as it was one place I went to, to purchase a dress for my brothers wedding. Expect to find unique pieces in here for all occasions along with a selection of casual wear such as Freddy Jeans! Now before I continue, can I begin by saying about the next stop, that I literally have shares in this place, and if I don’t well I absolutely should have!! 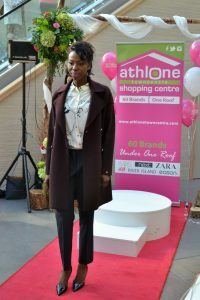 Its none other than my favourite shopping centre, Athlone Town Centre, It has every high street store a girl could want under one roof. But you can read all about it in a previous post here We were treated to a fashion show, show casing all of what the stores have to offer. 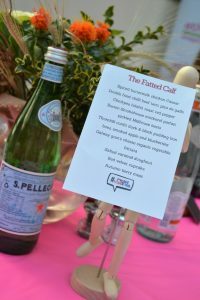 We most certainly had worked up an appetite after all the fashion shows and walking, so a quick nibble with delicious bites served from The Fatted Calf . This is one seriously tasty restaurant and one to pop at the top of your list of places to visit if your a foodie or even if you are not its just divine! 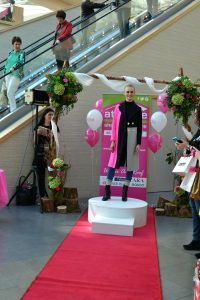 Back at it in the afternoon and it was some more gorgeous outfits from Athlone town centre. 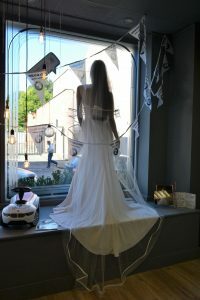 Next stop Clodagh Boutique which has gorgeous clothing catering for occasional and casual wear. Along with fabulous accessories. And onto Nells Closet (an old haunt of mine before moving to Cork), this shop is a treasure chest, trust me when I say you will not leave empty handed! 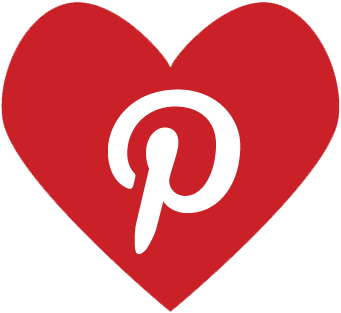 It has amazing stock and pieces…the wow factor! There was so many gorgeous dresses how could a girl even choose? With a quick stop back at Burgess, we then headed to the Radisoon Blu Hotel Athlone for the wrap party. Now I wont lie this hotel holds a special place in my heart as its where myself and Hubbie wed, so its always nice to pop in for a visit. The whole day from start to finish was amazing and to all the sponsors above I couldn’t thank them enough for their generosity and treating us like royalty. Athlone is undoubtedly one of the best shopping meccas in Ireland not to mention the midlands, the trail only scratched the surface as to what’s on offer in Athlone and I think you’ll agree, a must shopping town to visit and spend a weekend or even a week in as you’ll just about manage to get to every fabulous boutique there! 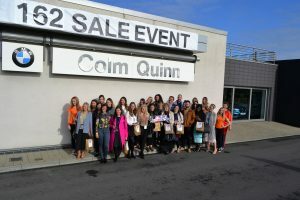 Thanks again to Goldenegg.ie, Galway now, Iradio, ITWBN and all sponsors for a fantastic, well planned “day out” No mean feat with 24 fashion starved bloggers!. Off now to massage my feet, traipsing around Athlone in heels is not for the faint hearted! With my partner in Crime Tanya from My Little Love Stories, we need medals for those heels! 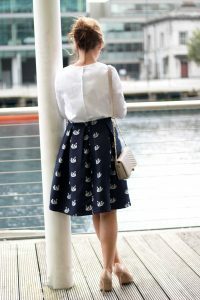 Following up from my previous post on Tulle skirts, here’s another option and how I style mine! This is most definitely a more dressier take! My wardrobe would make a magpie proud…its insane, my husband is bewildered with the amount of loose sequins he finds on his clothes etc! But who can resist? 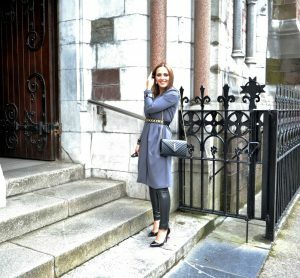 This is such a fun outfit, the plain white top underneath is penneys picked it up for €5 before summer, and it goes perfectly with the cape. Because there is so much detail in the cape you need to keep everything underneath plain and simple.